In the Spring Cepheus rights himself up, so you can study its stars much more easily than in winter. 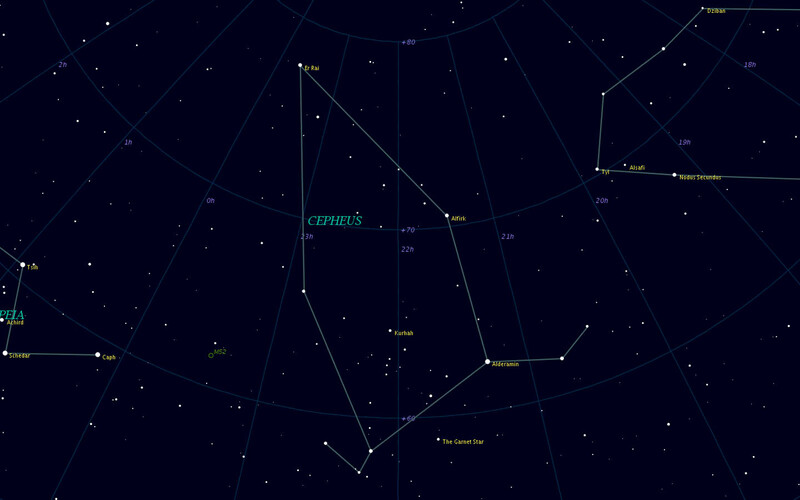 Facing north, you will find Cepheus generally between the horizon and the Pole Star. To find the constellation, first locate the Big Dipper. Draw a line from the bowl stars of the dipper through the Pole Star and continue past about a third of that distance (about two binocular fields). You'll come to gamma Cephei, which marks the tip of the dunce cap that the mortified king is forced to wear. Alpha Cephei is known as Alderamin, "The Right Shoulder" (of the king). The brightest star in Cepheus with a visual magnitude of 2.5, it has a distance of 49 light years. To find Alderamin, move eight degrees south of beta Cep. Now, if you place Alderamin at the right side of your glasses, the finest binary, xi Cephei, becomes visible on the opposite edge. The reddish (or yellow) companion orbits the blue primary every 3800 years. The present PA is 275� with a separation of 8.2". Delta Cephei is one of the most significant variable stars, the prototype of what are called "Cepheid variables". Through studies on the periods of the variability of Cepheid stars, it has been possible to more accurately gauge distances to outlying galaxies. To the careful observer the change in magnitude is noticeable. Delta Cephei varies from 3.5 to 4.4 every 5 days 8 hours 47 minutes 31.9 seconds. Compare its magnitude with zeta Cephei, in the same FOV. Zeta has a magnitude of 3.4. Thus delta will be equal to zeta at its maximum, while noticeably dimmer at its minimum. To find delta Cephei it will be easier to hop from another star, mu Cephei, the star that William Herschel so enthused over for its particular shade of red that he named it the Garnet Star. Delta Cephei is due east of mu Cephei; first you'll come to zeta. Centering this star brings delta to view. You will note the binary Kr�ger 60 very close to delta, to the south. The primary is only 9.8 visual magnitude, a red dwarf with another red dwarf as a companion, visible in larger telescopes (the companion's visual magnitude is only 11.4). This companion orbits every 44.7 years. The year 2000 values are a Position Angle of 95� and a separation of 3.0". The binary is only 13.1 light years away; the companion has one of the smaller masses known, at only .14 of the Sun's mass. Its luminosity often changes quickly because of flares on its surface; this change is visible even with medium-sized telescopes. Gamma Cephei is named Er Rai, the Shepherd, although now it serves to mark the tip of the dunce cap which the humbled king is forced to wear. The star is an orange subgiant 45 light years away. In another 2000 years this star will become the pole star. Gamma Cep is a convenient way to begin to study the stars of Cepheus. You should have found it by drawing a line from the Big Dipper to the Pole Star and continued the line another third of the same distance. From gamma follow the curving stars in a counter-clock direction one field of view to beta. Mu Cephei is the famous "Garnet Star", so named by Sir William Herschel for its vivid red, even noticeable in binoculars (if somewhat more so in telescopes). Mu is a semi-regular red supergiant. By definition semi-regulars have no set period, thus its variations, from 3.6 to 5.1 magnitudes, cannot be predicted. To find mu Cephei place alpha Cephei at the top of your FOV. Toward the bottom will be mu Cephei.